While this is true, and the British are genuinely experimenting with hybrid technology it’s just that it’s not in the sense most of us are thinking of it. I guess this is what research and development in engineering is about, namely, Jaguar is experimenting with an XF that has a flywheel hybrid system. The project name is FHSPV (Flywheel Hybrid System for Premium Vehicles) and the promises from it are relatively substantial as the spec sheet reads out for a 80 horsepower gain and an improvement in fuel economy of 20 percent. According to Daniel Loftus, project engineer behind the FHSPV what Jaguar are doing is experimenting mechanical flywheels and see how they compare with electric hybrids. Another point of this experiment that also cost the government’s Technology Strategy Board the round sum of 2.2 million pounds is to see if this can go into production and work as a viable economic proposition. According to the geeky documentation it would seem that the flywheel’s hybrid system is driven through a CVT gearbox and spins at up to 60,000 rpm to store the equivalent of 80 horsepower. This is where a computer controls the flow of power to the flywheel, which subsequently spins and delivers a boost during travel. 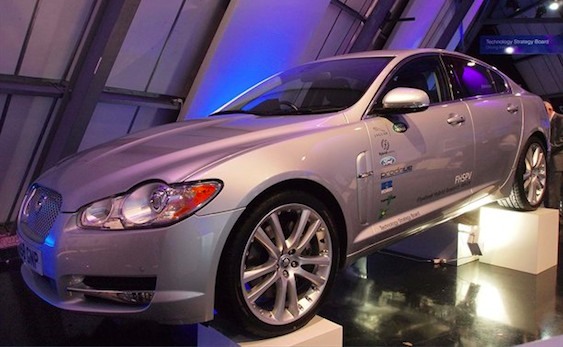 Jaguar engineers are testing the system in a stop-start city mode and have already recorded fuel savings of 20 percent. The complete system weighs in at 143 lbs, half the weight of a comparative hybrid system. It would seem that Jaguar aim to demonstrate that progress can be made without completely radical changes to the way a car works.